As we head into winter, we’re going to encounter much colder temperatures, which means we need to take some added precautions to ensure our diesel trucks won’t be hindered by the cold. 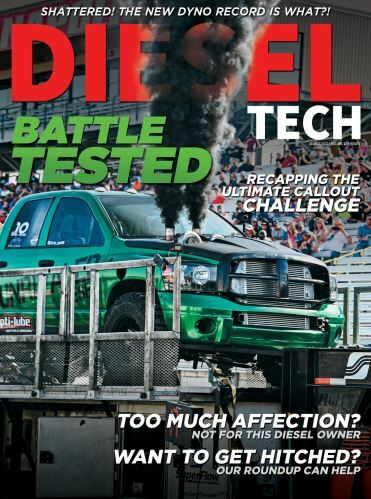 About five years ago the editors of Diesel Tech Magazine went into some detail on what you can do to make sure the cold doesn’t shut you down. We’ve decided it’s about time to rehash and update this information for our readers so you won’t be left stranded in the cold. Most consumers fail to recognize that gas-powered engines and diesel-powered engines ignite differently. Gas uses a spark. Diesel uses compression. But ultimately, ignition is created by heat. Diesel truck owners are well aware of this process. Obviously, when the winter temperatures drop well below freezing, heat can become a rare commodity. If your engine block is basically equivalent to a block of ice, any attempt to create heat by compressing air is being challenged by all the cold surrounding the air being compressed. This is the primary reason why diesel engines can have starting issues in cold weather. However, the modern diesel engine has overcome most of these challenges. Today’s technology has become very effective in cold weather conditions. But it’s still wise to know the physics behind the process. Fuel is best ignited in a vaporized state. However, the lower the air temperature, the more challenged fuel is to accomplish vaporization. When air temperature is lower than normal, compressed air temperature also will be lower than normal. Thus the evaporation process will be slowed and self-ignition via compression becomes more difficult. Without proper additives, diesel fuel tends to gel when temperatures drop below 40 degrees F. Since combustion is most efficient with aerosolizing fuel, the finer the mist, the more efficient the combustion. So in extreme cold, you want to do all you can to cut the cold edge out of the combustion process. This is why diesel engines have glow plugs. The plugs generate some instant heat in an effort to warm the combustion chamber (and the surrounding metal) to facilitate the evaporation process. This is why it’s important you wait until the “glow light” is off before cranking your starter. Sometimes this will take up to 15 second. Be patient. Remember, when you crank a cold engine, you’re actually introducing more cold elements (the fuel) to the engine. If the glow plug hasn’t been given enough time to work, you’re just thwarting its efforts by pouring cold fluids on the problem. A cold engine block will absorb some of the heat that the cylinder compression is trying to create. This can prevent the air/fuel mix from achieving ignition temperature. Unlike gasoline which will reach vaporization (ignition) below 360 degrees F, temperatures to ignite diesel fuel must be closer to 660 degrees F.
In order to avoid cold weather starting problems, it makes sense to do a little planning to solve issues before they become real problems. First, pay attention. Keep up on your vehicle maintenance. Make sure your batteries are in good shape; your oil is fresh and the SAE Grade is consistent with expected low temperatures (10W-40 or 10W-30 regular oil may not permit your starter to spin the engine fast enough in cold weather); your fuel is fresh and your filters are clean; your fluid levels (including axles and transmission) are good. Check your serpentine belt and pulleys; inspect your cooling system and hoses. Keep your antifreeze level topped off. Make certain your block heater, cord and plug and in working condition. Also check to ensure your glow plugs are functioning properly. Second, inspect your batteries. Clean not only the posts but the area around the posts. Grit, grime and dirt can bleed power from your battery. Check your connections and replace any wiring harnesses that are showing wear. Be certain to check the positive cable attachment at the starter. This has a tendency to become corroded over time. Corroded cables can cost you cranking amps … and during the winter, you’re going to want all the cranking amps you can get. You may also opt to have a portable starter battery handy in case you need a boost to your cranking amps. Third, know your fuel. Diesel is not like other automotive fuels. Straight #2 diesel without additives or blending will start to cloud at around 20 degrees, and will start to gel at 15 degrees. Gelling is a process where the waxes inherent in diesel fuel become cold enough that they freeze, come out of solution and bind together. Once the fuel becomes gelled, it will clog the fuel system components and fuel flow will be impaired. There are two ways to combat this problem. Using a blend of #1 diesel fuel with #2 diesel helps prevent gelling. In areas where temperatures routinely drop below freezing, fuel stations will blend diesel fuel for the anticipated temperatures. If the station sells #1 and #2 from separate pumps, fuel can be custom blended if you know what you’re doing. Since the cloud point of #2 diesel is lowered by about 3 degrees for every 10 percent volume of #1 diesel added, you can drop your cloud point by 10 degrees by going to a 3-to-1 mix. However, the side effect is that #1 diesel does not produce as much power per unit as #2 diesel so the end results will mean you will have lower mpg and less performance. Also, #1 diesel has lower lubricity for fuel system components. Fourth, fuel additives. Although additives can be purchased at most fuel locations, they are often pre-mixed in #2 diesel at the pump in cold-weather areas. You can add additives to #2 diesel that has pre-mixed additives … although it may be somewhat redundant and a waste of money. But at least you err on the safe side. Nearly all diesel additives have the ability to lower the gel point. The additive uses a chemical formula that dissolves the wax bonds in the fuel, which prevents the gelling. The amount of additive required usually goes hand-in-hand with the amount of fuel it is added to, but sometimes the quantity of additive is more dependent on the anticipated low temperature. Furthermore, additives have a benefit that is not present with fuel blending; they utilize a lubricity package that helps lubricate fuel components. Lubricating fuel components is claimed to improve injector life and extend the lifespan of the components. There are many diesel additives available in today's market. However, try to avoid alcohol blends since they can potentially separate in extreme cold.